We were very excited when we heard that Hetty from Arthur Street Kitchen in Australia was moving to Brooklyn, Hetty's salad delivery service is a very inspiring company where she locally delivers homemade seasonal salads to homes. We are hopeful Hetty might this service here as well, she certainly has a few signups at the SS studio. So in continuation of this new #studiomeals series we invited Hetty to come over and make a salad with us. She brought what she had in her refrigerator and we contributed what was in ours. 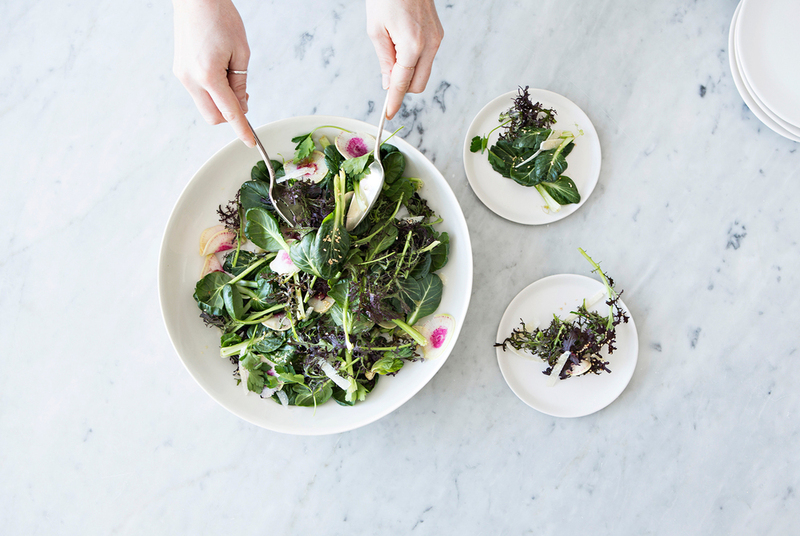 We ended up falling in love with Tatsoi and making two salads. Here is the first. Make the dressing by peeling and grating the ginger and chopping the garlic finely. Combine the two in a mixing bowl or mash into a paste with a pestle and mortar. Add the honey, lemon, apple cider vinegar and olive oil and whisk to combine. Add some of the dressing, but only lightly, so as not to overwhelm the flavors and buoyancy of the greens. To serve, sprinkle the salad with the sesame seeds as a garnish and add salt and pepper to taste. Top with shavings of good pecorino, as much as is desired.